(From Olympus lens literature) The ZUIKO DIGITAL ED 14-35mm ƒ/2.0 SWD, which covers a zoom range equivalent to 28mm to 70mm on a 35mm camera lens is the world's first standard zoom lens to feature a large ƒ/2.0 aperture. Note: we have updated our review to reflect some questions raised by readers regarding lens extension during zooming, the manual focus system and an over-sharpened look in sample photos. It's worth noting that when shooting our test images with the Olympus E-410, objectionable halos appeared with both Noise Reduction options off (Noise Filtering and Noise Reduction). With Noise Filtering Standard and Noise Reduction set to on, you get a normal-looking image. We have re-shot our sample images; our lens tests were originally run with the correct settings. In March 2007, Olympus announced a lineup of new lenses to accompany the replacement to the venerable E-1 Olympus pro SLR camera body, of which the 14-35mm ƒ/2 SWD was one. Available since the first quarter of 2008, Olympus digital cameras use the four-thirds sensor format, which provides a 2x ''crop factor.'' This gives an effective field of view of 28-70mm in 35mm film terms. The newer Olympus SWD lenses don't mount on older Olympus bodies, as they are designed for cameras with the four-thirds sensor. It's noted in the lens manual that to use this lens on the E-300 camera, its firmware must be updated to version 1.3 or higher. The lens offers a constant ƒ/2 aperture throughout its focal length range, making it a full stop faster than the lenses on offer by other manufacturers in the 28-70mm category. The lens takes 77mm filters, comes complete with a petal-shaped lens hood with windowed access to an attached polarizer, and is available now for around $2,200. The Olympus 14-35mm ƒ/2 is a very sharp lens indeed. It is so sharp, in fact, that it is hard to decide on the optimum aperture / focal length combination for optimum sharpness. According to our test results, 18mm at ƒ/4 seems to yield about as perfect sharpness as can be obtained, but in reality, you'll be very hard-pressed to notice any differences for sharpness at any aperture below ƒ/11. The lens is optimized for the wider end of its aperture spectrum, providing results for sharpness at ƒ/2 that consumer lenses would be envious of at ƒ/8. At ƒ/2 there are some traces of corner sharpness in the extreme edges (~2 blur units ,with 1 blur unit in the center), but by ƒ/2.8 these have disappeared. Through ƒ/2.8 - ƒ/5.6, image quality is exquisite and tack-sharp, and it's only at ƒ/11 that our tests note anything other than 1 blur unit. At ƒ/22, the images get a little softer, hitting 3 blur units from corner to corner. Not that this is a lens that will likely get shot fully stopped-down. It's worth noting that there isn't much a difference in performance whether you shooting wide at 14mm, or ''less wide'' at 35mm. In short, absolutely top-rated performance, as you would expect from a lens with this price tag. The tolerance of the 14-35mm ƒ/2 to chromatic aberration is also very good. Performance in this category is optimized at the wider end where we do tend to see more chromatic aberration in wide-angle lenses; for the 14-35mm ƒ/2, you're less like to see it at 14mm than at 35mm. According to the tests, we have noted statistically significant, but hardly noticeable CA throughout the image: 2/100ths of a percent of frame height between 14-18mm, and 3/100ths between 24-35mm. These results are seen is regardless of the aperture setting. In the corners, as usual, CA is statistically higher, jumping from a very good 3/100ths of a percent of frame height at 14mm to the worst case of 6/100ths at most other apertures and focal lengths. These aren't big numbers, and you can check the sample photos to see if these results are significant to your work; certainly, it's better performance than we usually see with wider-angle lenses. The 14-35mm ƒ/2 does produce some corner shading, but mostly when used at wide angle (14mm) with the aperture wide open at ƒ/2. At this setting you will note corners that are 2/3 of a stop darker than the center. Any other setting produces better results than this: at ƒ/2, you'll see between a 1/3- and 1/2-stop difference, and at ƒ/2.8 and 14mm, the light falloff shows at around 1/3 of a stop. Any other setting is a quarter-stop or less. Distortion is very well-controlled on the 14-35mm ƒ/2, giving results which are to be expected from such a wide-angle lens. 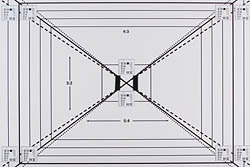 Used at its widest angle (14mm) the lens produces significant barrel distortion in the corners, just over 0.5%, and about 0.4% in the center; this decreases as you zoom in to the image, until a 0-distortion parity is achieved around 28mm. Technically there is a little barrel distortion at 25mm, less than 0.1%, but effectively you won't see it; this makes for a very acceptable ''standard'' 50mm lens. Greater than 28mm, and we start to notice a slight pincushion distortion, but it's not terribly significant: around -0.1%. Olympus has claimed that its autofocus system is the fastest on the market, and while the absolute focus speed is heavily dependent on the body being used, we can state that the 14-35mm ƒ/2 is a very fast focuser. Olympus has built focus control options into the camera, so selecting the ''AF+MF'' mode allows the user to override autofocus at any time by turning the focus ring. The focus ring is also mechanically linked to the lens elements, allowing for standard manual focus operation (some Olympus lenses use a fly-by-wire system to effect manual focus). The 14-35mm ƒ/2 would make a very poor macro lens, with a magnification ratio of only 0.12x and a minimum close-focus distance of 35cm (around 14 inches). The Olympus 14-35mm ƒ/2 is a hefty lens, built very solidly with a distinctly professional quality. It's almost as wide as it is long - just under five inches - and weighs in at just over 2 pounds. Besides a windowed distance scale, the only features on the lens are the focus and zoom rings. The rings are made of a thick rubber and have an excellent texture. The zoom ring is a 'checkerboard style of raised squares, while the focus ring is composed of fine raised ridges. Both are nicely damped and turn smoothly, if a little stiffly. The lens design consists of a whopping 18 glass elements. The design of the lens requires about a half-turn of the focus ring to go from closest focus to infinity. Zoom travel is more conventional, and a forty-degree twist of the zoom ring will take you from 14mm to 35mm. There is some slight lens extension as the lens zooms from 14mm to 35mm, with the lens extending out 5/8'' at the wide and tele ends, and at its shortest around 25mm. The LH-82B lens hood included with the lens is a petal-shaped plastic bayonet mount model with a flocked interior. The hood has a removable door for access to polarizer rotation. Unfortunately, neither Sigma nor Tamron offer comparable lenses, so if you're shopping for a lens in this category, your options are a bit limited. Significantly less expensive, the 14-54mm offers a greater zoom range at the expense of the constant ƒ/2 aperture of the 14-35mm. Optically the lens isn't as sharp as the 14-35mm, getting its best results at ƒ/4; it also shows much more CA at 14mm. Corner shading is about the same, but the 14-54mm is better tuned to prevent distortion. Of course, the 14-54mm costs about a quarter the price of the 14-35mm. While we haven't yet tested this lens, the user reviews are very positive, and it's much less expensive than the 14-35mm. It doesn't match the 14-35mm for its constant ƒ/2, but does go both a little wider and longer. Designed for the Panasonic Lumix dSLR, we haven't yet tested this offering from Leica and Panasonic, but it should work on Olympus bodies. Again, it's not as fast as the Olympus 14-35mm, but it does offer slightly more length in its focal range. This lens has optical image stabilization built-in to the lens, which has been shown to interfere negatively with Olympus' in-camera stabilization. It's worth noting that the 14-35mm ƒ/2 is an all-around better lens than the 25mm ƒ/2.8 prime: whether it's for sharpness, chromatic aberration, corner shading or distortion, the 14-35mm does it all better. 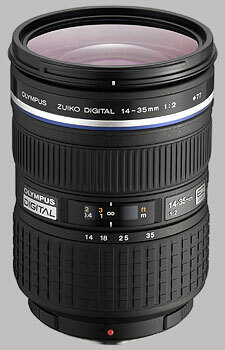 However the 14-35mm costs over seven times the price and weighs nine times more. If you're in the market for this lens, you're probably looking for some words of encouragement before you take the hit on your credit card: allow me to offer some. If you need this lens for professional purposes it will deliver unquestionably. If you want this lens because your standards are very high, they will be met. Olympus has clearly invested a lot of time and energy into producing this lens: the results speak for themselves. 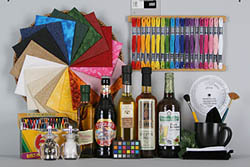 As noted above, we have re-shot our sample photos to correct apparent over-sharpening. You might have noticed that this lens costs a lot. That's okay, though, because it's absolutely fantastic. First off, though, it's worth mentioning that this lens is huge. It's heavy and it's big. I find that it feels good on my E-5, but on my E-420 it feels like I'm attaching my body to the lens. You usually need to get into the tele range for that sort of thing. This lens is big enough that people notice it, so I don't generally travel with it (both for the weight and the attention). The constant f-2 is very easy to get used to. Your aperture just becomes something you no longer have to worry about because you've always got every option available. Of course, this explains its size and weight. The character of the image is definitely Super High Grade. I've also got the 11-22 lens, which is High Grade. The 11-22 is a noticeable step above the Standard Grade. This Super High Grade is an even more noticeable step above the High Grade. Others have said it before and I tend to agree - if you're familiar with the image quality of the 50mm f-2 macro lens, this lens offers that quality between the focal lengths of 14mm and 35mm. I was a bit concerned at first regarding the focal length range. It's gotten to the point now that zooms cover such a broad range, a smaller range seems like a flaw. But I no longer think of this lens's focal length range that way. I look at it as normal lens with wiggle room. If you zoom it to the middle, it's essentially a normal lens, but you can zoom in or out a bit if you want. I think if you can understand it that way, you'll get a good idea of whether or not this lens will suit what you need to shoot. This lens is sharp enough that I once got a moire pattern with my E-5. I use this lens on my Olympus E-5 and it is outstanding, a big step up from the already good 12-60mm zoom. I also used it on an E-3 and while good, the images from this lens on the E-5 just blow me away. It is like using Leica glass on your DSLR, with the convenience of being able to zoom, it really is that good. With the F2 aperature, Size and weight are apparent, I use it on an E-5 with the grip attached and it balances rather well, without the grip it's not as easy to use and you do become aware of the weight. If you purchase one you will not be dissapointed. New E-5 needs a outstanding lens I said to myself and got an affordable copy with warranty here in Switzerland. Usually you don't find NIB copies for that price. The sharpness is impressive. Even wide open it remains tack sharp. The autofocus on the E-5 is accurate and fast. It has slight back focus, but on the E-5, this can be adjusted by adding +3. It is heavy, yes, but having had my A850 and the Vario-Sonnar ZA24-70/2.8 these 900gr are no big deal. The build is solid. Waterproof for sure. The Zeiss wasn't, I have to mention here for the same amount of money. Thinking about the comparision to my FF equipment, the 28-70mm are not too limiting. of course, 12-35/2.0 would have been better, but I can live with it. This is definitely the right lens if you want to do AL and not to be constantly switching to the primes. I agree with OhWeh reveiw ... and also bought the lens for Concert, & Events ... right now shoot it with a e510 (but, have used e3), waiting for the e30 tweener :) ... Bottom Line, I LOVE this Lens. imho, the best Lens Olympus has right now, and imho it might be the best standard zoom (24-28 to 70mm efl) out there right now ... (even better imho than the Canon 24-70 f2.8 L ... look at wide open at f2.0-f2.8 and/or f4.0-f5.6 at 70mm, where you will use it for portrait, = Equv even on a 5D) ... but all is not perfect, there is a AF Low Light/Low light contrast issue that shows up in a few shooting conditions ... and am not sure if it is a Lens SWD issue or a Body AF issue with this lens ... because, even when the lens takes 3 small fast adjustments to lock (in low contrast), when you re-focus on the same target, It does the "same" 3 small fast adjustments- like it does not know it is already in focus. And in some low contrast situations a Non-SWD OLY lens "might" end up focusing faster (with a solid lock) and with less adjustment steps ... which should not be the "case" vs an SWD 14-35 f2 lens. * With ALL that being said, I still LOVE the lens and plan to keep it ... and because of my "past" great experiance with the "QC" on ALL Olympus lens ... feel confident the issue will eventually be resolved. An outstanding lens with fast AF. I use it almost solely in concerts, where I need the open aperture. Combined with the E-3 (with its IF) it is as good as a Nikon D3 (my personal opinion of course). For me it is not too heavy or too large. Of course on a E-420 it looks a little bit funny. And of course it is not a lens for hiking (Therefore you should use the 12-60).